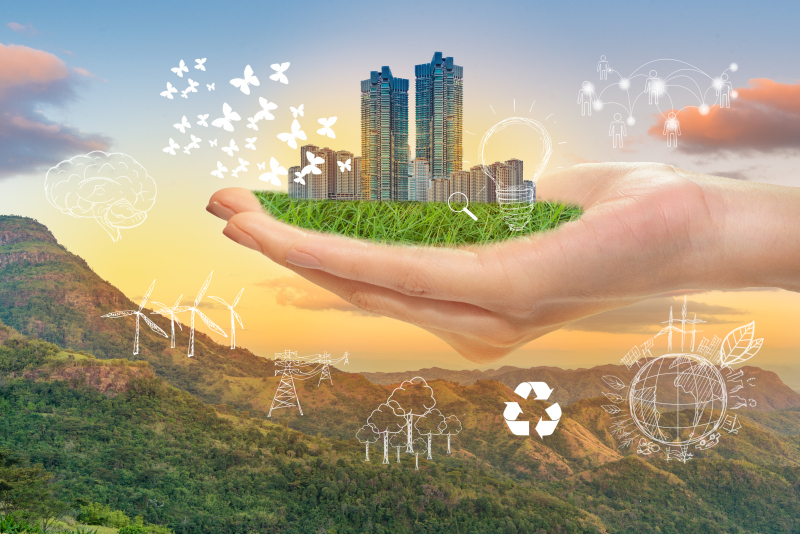 In the journey to net-zero buildings and developments that are resilient, “architecture must celebrate climate, culture and region, balancing deep conservation with the dynamic embrace of natural conditioning”. This is according to Professor Vivian Loftness, an internationally renowned researcher, LEED fellow, professor of architecture and Paul Mellon Chair of Architecture at Carnegie Mellon University, USA. Loftness encourages architects, designers and engineers to design for “environmental surfing” – to capture all that nature has to offer before advanced technologies. This approach to architecture has both style and is optimally energy-balanced. Beyond energy, however, environmental surfing embraces the potential of local water, food, land use and mobility. the value of regionalism lies not only in resource conservation but also in the delight of cultural richness. “Energy and environmental effectiveness does not demand a stylistic response in architecture, but a more fundamental change in design approach: To celebrate the dynamics of climate and place by choosing sailing over motor yachting, and surfing over jet skiing. “Just as sailing and surfing embrace the natural flows of sun, wind and tide, as well as the engaged participation of the athlete, environmental architecture embraces the dynamics of sun, wind, light and temperature, and the engaged participation of the occupant, to bring comfort and delight without dependency on non-renewable energy. 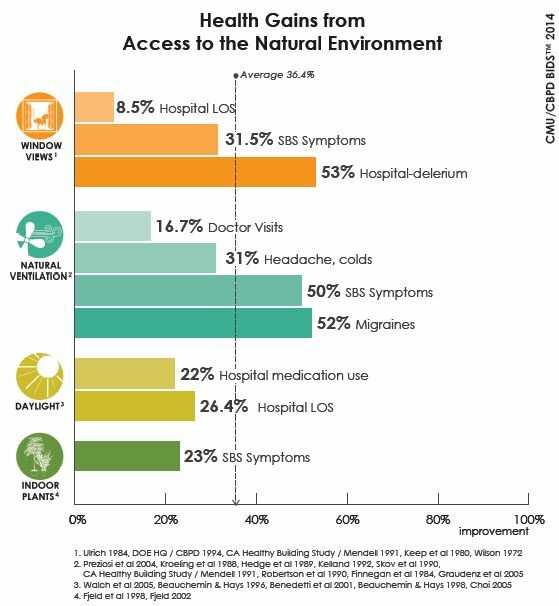 Loftness explains that there are many areas in which environmental surfing can preserve, cascade and regenerate natural systems. Office buildings worldwide consume excessive amounts of energy for heating or cooling the interior all year round. Loftness points out that through conservation techniques including air tightness and much more insulation, loads can be reduced by about 35%. Yet embracing nature as a driver of form, place, details and materials can take us much further. She highlights that the shading of a building is a highly architectural activity to be embraced region by region, orientation by orientation, with seasonally dynamic and culturally inspired solutions. But even when no heating or cooling is required for comfort, air-conditioning systems are working overtime in many office buildings to supply fresh air. Yet natural ventilation could displace about 80% of this energy use. “It is only through embracing natural ventilation and designing our mechanical systems to be mixed mode that we can get the loads to a point where the use of renewable energies will ensure net-zero,” she adds. Net zero buildings should also be designed for daylight to be the principal light source in a building. “In rediscovering the engineering and art of effective daylight design, one can displace between 35% and 75% of electric lighting,” Loftness states. Then the use of energy efficient and user controllable solid state lighting can meet the remaining loads at night. At the moment, there is very little design creativity in the water realm, Loftness argues. “We consume water without a quality of life gain, we use potable water for everything and we use it only once. We flood our cities and we contaminate our rivers. This is what we do as designers today”. “What we need to do, is to embrace a whole new way of thinking about water. All water infrastructures should become visual and recreational amenities – we should design them. Runoff should be eliminated and all site water should be captured and used for living landscapes. In fact, all water needs to be used three times, for potable, grey and black water needs. While the future of water has a big infrastructure component to it, it also requires strong architectural responses as all rainwater and storm-water systems become design features. Although environmental surfing is focused on natural energies and systems, the human factor also plays a crucial role. “People become willing to walk if the environment is designed to be amenable to walking. They are willing to bike if the environment is amenable to biking, and in mixed use design, the vibrancy of everyday life begins to be knitted together,” Loftness states. “Walkable communities filled with a diversity of cultures, ages, professions and skills can in turn be linked to other communities and shared amenities by bikeways and high-speed rail without losing family or community time in traffic, airports and hotels. It does not, however, eliminate the ability to get into a car to drive somewhere exciting, it simply takes it out of the equation of a necessity on a daily basis,” she explains. Bringing all the aspects of environmental surfing together and adding technology that enables the Internet of Things (IoT), Loftness emphasises that integrated design practices are central to delivering high-performance buildings with mixed-mode conditioning. “Mixed mode is the perfect alliance of passive conditioning with just the right level of active technology to make the air quality, thermal, visual and acoustic environment healthy and productive, while keeping humans in the loop,” she states. • Providing openable windows (with HVAC response). • Moving 40% of the programme into naturally conditioned space. • Separating thermal and ventilation systems. • Micro-zoning mechanical and lighting systems and providing individual controls and real feedback for health, productivity and energy conservation. “The design masters of environmental surfing will preserve, cascade and regenerate nature’s abundant resources for sheer delight; create technologies that mimic nature and regenerate without waste, displacing design that cuts us off from the environment. “The architecture produced by environmental surfing will celebrate the time of day, the seasons, and importantly, the culture that is unique to each community and to nature’s creative energies, central to a resilient future,” Loftness concludes. Full thanks and acknowledgement are given to Professor Vivian Loftness, LEED fellow, professor of architecture and Paul Mellon Chair of Architecture at Carnegie Mellon University, USA, for the information given to write this article. Environmental surfing for sun, light, air and natural cooling contributes measurably to human health and productivity. 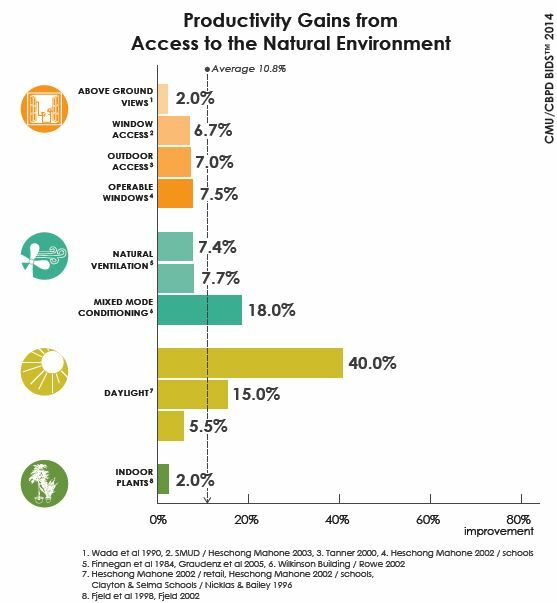 These graphs respectively show the health and productivity gains from buildings that have access to natural elements. If you enjoyed this article, please join other discussions like this on http://www.facebook.com/buildinganddecor, http://www.twitter.com/buildingdecor and https://www.linkedin.com/showcase/10172797/, and sign up for our newsletter: http://www.buildinganddecor.co.za/register/.